Have you ever taken the wrong turn? Do you use WAZE or GPS? 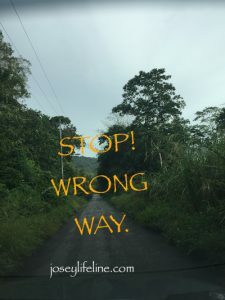 The thing about having WAZE or GPS is that if you take a wrong turn, you do not hear- ‘STOP! WRONG WAY’, they automatically recalculate the directions for you. That is how it is with God. You take wrong turns every day or make wrong decisions, and somehow, some way God is there re-directing you. Call it luck, coincidence or whatever you want, once you are open to guidance you would receive it. Don’t beat up on yourself ask God for help and he would be quick to show you the way.